How to read resistor color code? What's the 10k resistor color code? With this resistor color code calculator you'll quickly and easily find out the resistance of your element. Just choose how many bands does your resistor have - 4, 5 or 6, select the colors, and in the blink of an eye you'll get the resistance with tolerance, range and temperature coefficient value (if you've chosen 6 band resistor color code). If you want to understand how to read resistor color code, scroll down and you'll find there formulas and explanation. Also, we show 10k resistor color code as well as many other informative examples. Color bands are an easy and cheap way of indicating the value of an electronic components. On the tiniest resistors the printed alphanumeric codes would be too small to read, so the color code was developed in the early 1920s. The first question which usually arises is: how do I know from which end should I start reading my resistor color code? Fortunately, couple visual hints exist! In a usual case, the bands are not spaced regularly - there's a gap, and bands are somehow grouped. The larger gap occurs before the tolerance band. Put the bigger group on the left side and read resistors from left to right. Very often the tolerance of the resistor is equal to 5% or 10%. These values are marked with metallic colors - gold and silver, respectively. However, the resistor color code never starts from such color - so if you find the metallic color on your resistor, it's definitely the tolerance value, so it must be placed on the right side. Again, read the resistor from left to right. Usually, the first band will be closest to the end (but not always, so then use other clues). If none of the above appear to help your problem, you can always use a multimeter to tell between two possible resistances - and reading directions. Ok, let's get down to brass tacks: How to read resistor color code? It's the color code working for the first 2 or 3 bands from the left side. Here, color represents the power of 10, by which the number created from previous bands must be multiplied. You can express the multipliers with prefixes like kilo, mega or giga (kΩ, MΩ, GΩ), but also the scientific notation is used - e.g. 10⁹Ω (gigaohm). So that's all you need to know about the colors meaning for 4 and 5 band resistor color codes. For 6 band there's additional ring indicating the temperature coefficient - read more about it in a paragraph dedicated to 6 band resistors. Scroll down and find out the formulas, depending on the type of your resistor! We've tried really hard to make the resistor color code calculator as simple and intuitive as possible, but if you have any problems, just have a look at the example below! Choose the number of bands on your resistor. There are three options: 4, 5 or 6 bands. Let's assume you have a resistor with five bands. Pick the colors of the bands. If you don't know which is the first and which is the last band, have a look at the pictures built-in the calculator. Generally, there's a gap before the tolerance band, so that's how you can recognize start and end. In our example, let's say we have the colors: brown, red violet, black and red. The calculator draws the colored band. Compare them with your resistor, is it the same order? 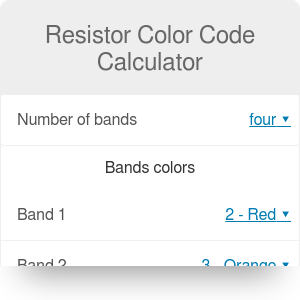 When you finish entering all bands, the resistor color code calculator will show you the resistance, with tolerance and maximum and minimum value resulting from a tolerance. In our example, the resistance should be equal to 127Ω. Additionally, if you've entered 6 band resistor color code, the 6th band meaning will be displayed as well: the temperature coefficient, in ppm/°C. Now, as you know how to read resistor color code, maybe you'd like to make circuit with resistors in parallel or in series? We have also other tools which are closely linked to the topic, like calculation of wire resistance or LED resistor calculator determining what resistance you should use when creating electronic circuit with LEDs. Take the third band - red. This time the meaning is different, because it's the multiplier band, and the corresponding factor is 100 Ω. Multiply the previous result by this value. And that's all! It wasn't so hard, was it? Check out the result with our resistor color code calculator. For that calculations we can also use Kelvin instead of degree Centigrade temperature, as the difference between temperatures is the thing that matters, not the absolute temperature value. Similar concept to TCR is a Thermal Expansion Coefficient - here not the resistance, but the length or volume of the element changes with the temperature. Watch out! Sometimes the sixth band doesn't mean the thermal coefficient but the reliability of the resistor, but those are sporadic cases. There's a lot of options, depending on tolerance and number of bands. Resistor Color Code Calculator can be embedded on your website to enrich the content you wrote and make it easier for your visitors to understand your message.